It's the penultimate episode of The Borgias' first season, and all hell is breaking loose in Rome. As one ally after another refuses to offer support, Pope Alexander is left with only the Vatican's forces to try and stem the tide of the French invasion. While plot advancement was the main focus of the episode, it was the characters that really made “The Art of War” shine, with the aid of some sensational performances from the cast. After being denied aid from Spain against the “French apocalypse,” and continued nightmares over his family's safety and the very safety of Rome, it was easy to think that Rodrigo was going to be even more distraught over his predicament. 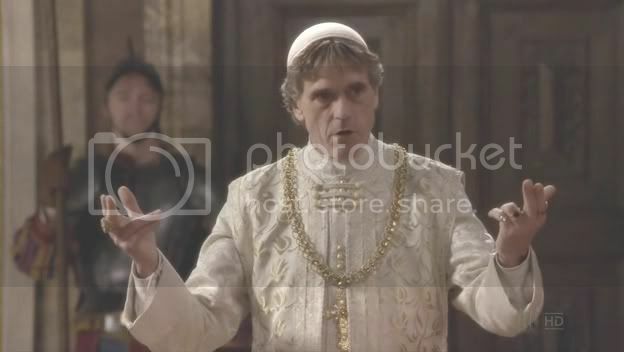 But the contrast between Pope Alexander's last meeting with the College of Cardinals and the one in this episode was done beautifully. Rodrigo steeled himself – not wanting to repeat their last conference when he ranted and raved only to appear weak and ineffectual, he instead presented a calm face and determined will. His confidence in his words and assurance that they would achieve the desired effect gave him an air of magnanimity that Irons portrayed perfectly. Going so far as to even lay hands on the cardinals, as if they were his most cherished colleagues, Rodrigo's intentions were by no means subtle. Unfortunately his confidence was hubris, as no speech could keep the cardinals and most of Rome's populace from fleeing like “rats deserting a sinking ship,” as Juan put it. Even so, it couldn't take away from an incredible scene or shake Rodrigo's resolve to go down with the ship, if he must. Lucrezia was not to be out shown by her father and put up an equally brilliant performance. Her and Giulia went from out of the frying pan and into the fire, fleeing from Pesaro and the inevitable wrath of Giovanni Sforza when he found out Lucrezia was pregnant with a child that couldn't be his, which led them right into the hands of the French army. Lucrezia was quite impressive in her scene with Della Rovere for both her razor-like wit and by showing no signs of distress over her current situation. Standing toe-to-toe with her father's nemesis and not cowering or backing down an inch, Lucrezia exhibited the trademark Borgia self-confidence that her father and two older brothers have already mastered. Even more impressive were her actions on the battlefield. After charming King Charles, Lucrezia is able to save Juan from his own incompetence by arranging a surrender and preventing him and the Papal army from being obliterated – and perhaps save Rome itself from French pillaging. While still relying on her innocence and youth, it's clear Lucrezia is learning they can be equally effective when applied in a coquettish manner, which is the kind of growth that makes her as interesting a character as Rodrigo and Cesare. While predictable, the lack of preparedness in the Papal army was still disconcerting and added to the growing sense of dread building up over the last few episodes, as did Cesare's conversation with Micheletto as they watched Juan lead the Vatican's troops out of the city. Their exchange also resulted in one of the nicer pieces of dialogue from the episode in Micheletto's line, “Where warfare is concerned, your Imminence, our Good Lord will take a holiday.” It was easy to mistake Cesare doubting Juan's ability as the elder Borgia's own resentment over his brother being given command of the military instead of himself, but there is more to it. Juan's real-life reputation as a military commander serves as inspiration for the character's ineptitude and is finally adding something to Juan that makes his scenes worth watching for more than the chuckles his behavior occasionally elicits. His reaction to the sheer size of the French horde was the first time the character has given us any real emotion, and his fear was well portrayed. The battle itself lasted only a single cannon barrage but its impact was massive for both sides, and the way it was executed provided a compelling scene mixed with drama and action. Lucrezia being more adept at the art of war, or at least the art of avoiding it, brought home just how unfit Juan is for the military. The final scenes are of Rodrigo shedding off all the Pope's finery in favor of a monk's simple robes – a powerful image and metaphor for how little he has with which to stand against his coming trial. Backing on God seeing him through, even if it's only because God is all that's left, was an effective way to ensure the audience is still rooting for Rodrigo going into the season's end. With only one episode left (fans take heart in knowing it's been renewed for a second season), it will be interesting to see if Della Rovere can succeed in ousting Pope Alexander or if the Borgia gift for manipulation will see their family through the quagmire of war and politics in which they're so deeply embedded.